My last couple mentions of viral immune evasion of T cells may have left the impression that immune evasion in general has a minor contribution to viral pathogenicity. Far from it. There are lots of examples — some very dramatic (I know of a couple really spectacular experiments that aren’t yet published) — of viral immune evasion genes that are important, or essential, for virulence. One example is influenza virus’s evasion of interferon. Everyone’s heard of influenza. It’s a relatively small RNA virus with many different strains, which differ in their virulence, host range, antigenicity, and so forth. As with many viruses, the interferon response (part of the innate immune system) can be a very powerful inhibitor of virus infection, and so it’s not surprising that influenza has evolved a way around interferon. It does this by means of a non-structural protein, NS1, which prevents interferon induction in infected cells. How important is this protein to viral infectivity, in vivo? The experiment has been done in a number of species. 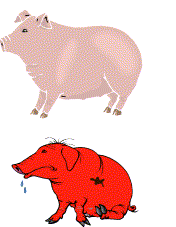 (One nice thing about influenza, from the researcher’s viewpoint, is that it does infect many different species, including some — mice, chickens, pigs — which are relatively easy to study.) 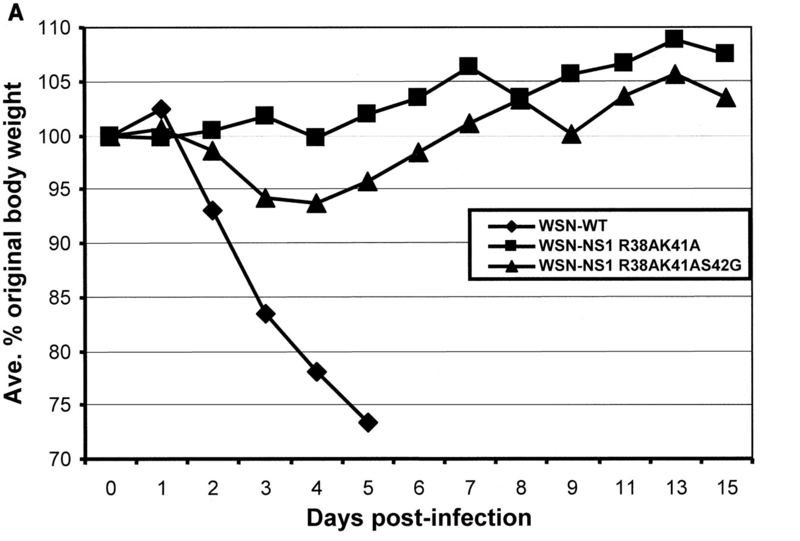 For example, Donelan et al1 made a mutant influenza virus that lacks the NS1 protein, and looked at its virulence in mice. 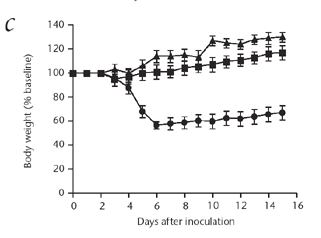 Wild-type influenza infection made the mice very sick: they lost weight (Figure to the right here; the diamond traces are the wild-type virus) and, around day 5, died of the infection, but mice infected with the mutant virus didn’t lose any weight (squares). As well, the virus replicated thousands of times worse in the mice. Although in this case mice aren’t the natural host of the virus, there are similar findings in, for example, chickens using avian influenza viruses2 so it’s pretty clear that this is an authentic virulence factor. So immune evasion genes can be really potent virulence factors, which really contrasts to the apparently-minor effects of the CTL immune evasion genes.